Merlot is the most popular and widely planted wine grape varietal in France, reaching its true zenith of expression in Bordeaux wine. Around the world, it’s the fifth most planted wine grape. Merlot has also been used to make stunning wines in Tuscany and to a much lesser degree in Switzerland, Australia, Argentina and numerous other countries, as well as in America. 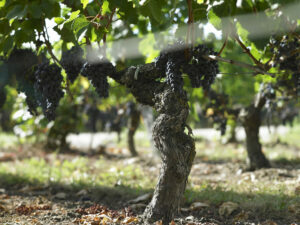 Merlot continues to gain in popularity as a grape for wine. In 1990, Merlot was the 7th most popular grape. By 2010, Merlot jumped to second place as the world’s most widely planted grape. Only Cabernet Sauvignon has more vines planted. According to studies conducted by the University of California in Davis, the Merlot grape is related to Cabernet Franc and Carmenere. Thanks to DNA, it is now thought that Merlot is a cross between Cabernet Franc and the obscure grape Magdeleine Noire des Charentes. Merlot started earning a reputation for producing quality wine in 1784, due to the growing fame of the wines produced in the Right Bank of Bordeaux. While the Right Bank of Bordeaux discovered Merlot in 1784, it took several decades until the grape started to become widely accepted in the Medoc, even though it is only used as a blending variety in that region. Merlot based wines are perfect for the lunch or dinner table, It’s naturally soft textures and rich flavors works well with a diverse array of foods. For the best wine and food pairing tips. Try matching Merlot wines with meat, lamb, veal and stewed dishes. Mushrooms, chicken and pork work great. Depending on the preparation, use it with fish, if you add earthy sauces or flavorings. Merlot based wines are also perfect for a myriad of different cheeses. Merlot and Chocolate work for some people, although it’s never excited me personally. The grape earned its moniker from its eye catching, dark, blue color. Merle in French is translated into a blackbird, which could be taken to reference either the color or the birds fondness for the sweet flavored, thin skinned grape. Merlot thrives best in the clay and limestone soils of Pomerol, Saint Emilion and Lalande de Pomerol. In those soils, Merlot delivers a unique expression that Christian Moueix, the owner of Trotanoy, La Fleur Petrus and other estates that combines feminine and opulent qualities. However, aside from France, Merlot is also popular as well as successful in Italy, California, Australia, Chile and Argentina. In Italy, the Merlot grape can be the heart and soul of many of the best Super Tuscan wines. All that being said, it is important to recognize that in part, what makes the Merlot in Pomerol much better than Merlot planted in any other wine region is that due to the terroir of Pomerol, the grape there is early ripening. This is not the case with many other leading viticultural regions. That is why the grape is able to obtain such a high level of sweetness and acidities. While most Bordeaux wines are blends, there are a few estates in Pomerol that produce a 100% Merlot wine, most notably Petrus. Some estates in St. Emilion are make wines using only Merlot, for example, Peby Faugeres and La Gomerie. However, most Bordeaux remain a blend of two or more varietals. According to the owner of Vieux Chateau Certan, Alexandre Thienpont, it is the blending that adds the extra special dimension to the magic of the Merlot grape. While Cabernet Sauvignon produces stunning and structured, classic Bordeaux wine, Merlot is capable of making the world’s most hedonistic, opulent and decadent tasting experiences. Those are all found in the best wines from Pomerol and St. Emilion. Bordeaux produces a lot of wine in a myriad of price ranges. But the most expensive wines of Bordeaux are the Merlot based wines of Pomerol. Petrus, Le Pin and Lafleur all sell for over $1,000 per bottle. In Saint Emilion, Chateau Cheval Blanc and Chateau Ausone are not far behind. All those wines routinely fetch higher prices than even the First Growths! Merlot is the most widely planted grape in Bordeaux. In fact, 62% of all Bordeaux vineyards are planted to Merlot. Merlot is the dominant grape in the Right Bank. Its unique ability to tame the strong tannins and structure found in the Cabernet Sauvignon that’s grown in the Left Bank of Bordeaux, as well as in Pessac Leognan, make it the ideal blending grape. Jean Michel Laporte of Chateau La Conseillante likes the complexity that comes from blending Merlot with Cabernet Franc. In the Medoc, Chateau Pichon Lalande, Chateau Palmer and Chateau Pibran have large percentages of Merlot planted in their vineyards. However, the vineyards in the Medoc with the highest concentration of Merlot planted in their vines remains Coufran with a whopping 85% Merlot in their Haut-Medoc vineyards! In Listrac, Chateau Ducluzeau is planted with 90% Merlot. At least 2 vineyards in the Medoc are devoted to 100% Merlot, in the southern end of the Bordeaux appellation you have M in Margaux and at the far north of the Medoc, Chateau Delhomme is made from 100% Merlot. Due to the clay found in soils of Margaux coupled with its warmer temperatures, you find more higher concentrations of Merlot in the Margaux appellation than you find in most of the Medoc. The wines of Pessac Leognan often feature large percentages of Merlot in the vineyards and blends. It is not uncommon to find many vineyards with close to half their vines devoted to Merlot. Merlot, due to its higher sugar levels and perforce, increased percentage of alcohol is sweeter than Cabernet Sauvignon. It also ripens earlier than Cabernet Sauvignon. Due to the fact that the Merlot harvest can take place two weeks before Cabernet Sauvignon is picked, wines from Pomerol and Saint Emilion can be more successful than their counterparts in the Left Bank in rain plagued vintages. Merlot, due to its success on ripening in the cooler Bordeaux terroirs, it is also the key grape variety in the less famous, but still high quality vineyards such as those located in the Cotes de Bordeaux appellations or various Satellite communes. In fact, most of the inexpensive, generic Bordeaux wines are usually dominated by Merlot as well. When ripe, Merlot reaches higher alcohol levels, naturally higher sugar levels as well as lower levels of acidity than Cabernet Sauvignon. Because most Bordeaux wines are blends, this is usually not a problem. 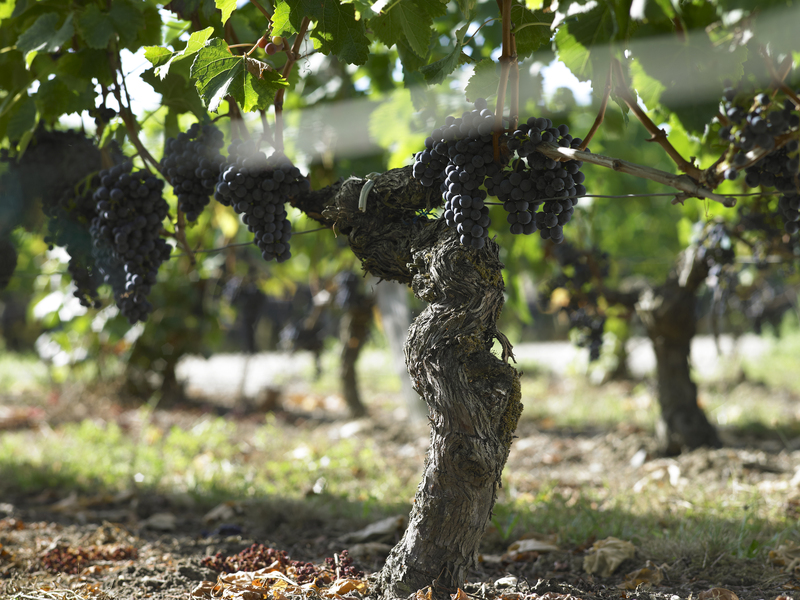 With global warming and a continuing succession of warm vintages, some Merlot grown in the Right Bank of Bordeaux are being replaced with Cabernet Franc as well as Cabernet Sauvignon. Merlot is more successful in California as a blending grape. While there are a few great Merlot wines from California, for example, Pahlmeyer, it’s a difficult grape for California soils and seems to work better for blends in the Golden State. Further north, Merlot is also quite successful in the cooler climates of Washington state. In character, Merlot offers flavors of chocolate, plums, licorice, black cherries, blueberries, black raspberries and blackberries as well as jam, which depends on the levels of ripeness the fruit was allowed to achieve. It is round, fleshy and can be opulent in texture.